The HEF 32 is a long range unmanned helicopter with a two-blade single rotor. 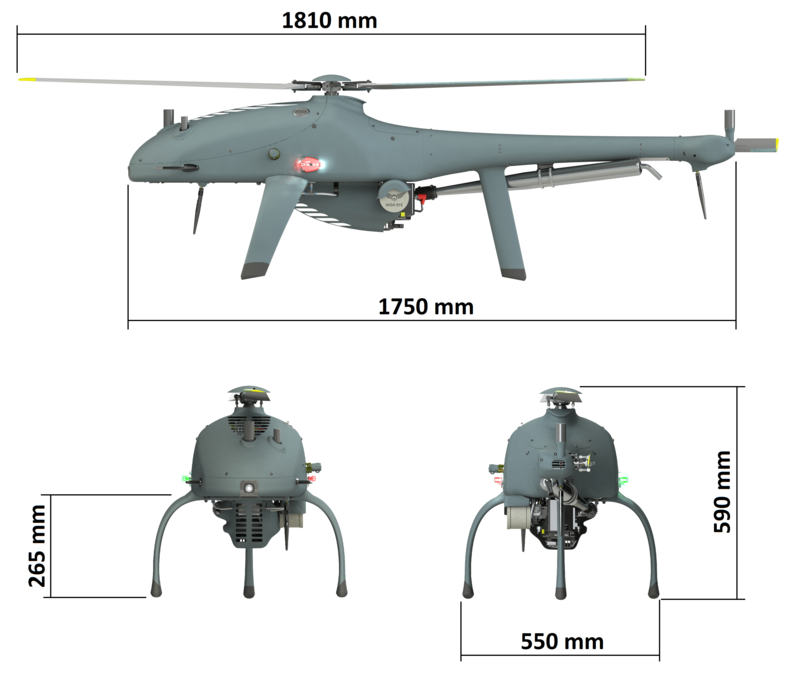 Because of its size, weight and capabilities, it creates a class on its own and brings industrial reliability into the UAV market in an unprecedented small size. High Eye believes a UAV should be safe to operate under nearly all circumstances and conditions, throughout the year. The HEF 32 has been developed over a period of more than 5 years and has been tested under the most extreme conditions on several continents. It has been proven to deliver reliability and capability at any time, wherever it is needed. The heart of the HEF 32 is centered around the gearbox and flight controls, which follow a modular layout and are constructed from carbon fiber, aluminum and steel alloys. The entire airframe is constructed out of pre-preg carbon fibre parts. The propulsion for the HEF 32 is a 32cc two-stroke petrol engine. It has been designed with simplicity in mind, containing a minimal amount of parts and beeing produced by the thousands. It is normally aspirated, air-cooled and can be removed externally without further maintenance action on the UAV. The induction and exhaust have been designed and tuned specifically to the unique operational requirements of a helicopter. Fuel is supplied via a 5L fuel tank and a simple gravity-feed system, backed-up by a fuel pump. All aluminum surfaces, including the rotor head, tail rotor, transmission, flight controls and frame parts have been surface treated to reduce corrosion whilst operating in maritime environments. All fasteners, nuts and bolts have been designed to reduce the chance of contact corrosion. Electrical connectors, seals and flight control actuators are rated for long-lasting operations in saltwater environments. The bearings are protected by rubber seals or have been replaced by industrial non-corroding friction bearings. The electrical system is rated at IP67 and has been designed for operations under high humidity. It is protected against electro-magnetical interference by combining industrial shielding technologies several layers of EMI filtering on all internal power, data and communication lines. The high grade of protection has made the HEF 32 fully compliant to MIL-STD-461F-RS103, meaning that it is able to tolerate field strengths of at least 200 V/m over a very wide range of frequencies. The HEF 32 can be used safely in close proximity to sources of high power radiated energy, as can be found on e.g. naval vessels. A connection for payload power and data is provided, which can accept different power or communication protocol requirements. A brushless alternator system provides continuous electrical power, whilst an on-board battery provides back-up electrical power. The HEF 32’s autopilot is fault tolerant and contains two full sets of CPU’s and IMU’s. It allows semi- and full automatic operations and has clearly defined emergency modes, which even tolerates extended operations in GPS denied environments. Navigation can be based primarily on GPS or on barometric data, coming from the redundant and heated pitot-static system. A third IMU provides a GPS based heading reference to the autopilot, for operations in areas where magnetic field accuracy is expected to be degraded. The HEF 32 is equipped with a full set of aircraft lighting. The lights are FAR23 compliant and meet the requirements for navigation and anti-collision aircraft lighting, for VFR aircraft below 7,000kg. They can be activated/deactivated at any time during flight from the Ground Control Station. Has been designed as a man portable system: a rugged laptop, robust external connections and a vest carrier. Uses a flight control joystick and collective lever for flying in semi-automatic and manual flight modes. Two guarded switches for termination of the flight in emergency situations. Can be powered externally via 230/110 Volt. An integrated back-up battery provides continuous power to all systems in case of emergency. Uses an integral IP module to split incoming payload data to other nearby computers. Is easy to integrate into tactical vehicles, combat management systems or control station containers. Provides semi- and full automatic flight modes in normal and emergency conditions. Can perform automatic take-off, in-flight navigation and landing through uncontrolled and segregated airspace via an advanced waypoint mode. Is single fault tolerant and will continue to stabilise the UAV after several sensory failures. Allows usage of no-fly zones, flight plan grids, complex approach patterns, DEM models and integration of additional sensors like a radar altimeter. Remains functional over extended periods without GPS inputs and provides automatic autorotation with flareout. Pilot training courses and maintenance training courses for the HEF 32 are provided to customers at High Eye in The Netherlands. General maintenance inspections and repair work can also be outsourced to an Approved Maintenance Organization (AMO). Sub-assembly overhaul services are provided by High Eye. Pilot training is provided in-house by High Eye personnel. The instructors share knowledge from manned aviation and several years of experience on the HEF 32 system. Training courses take place at fixed dates several times every year. General training for pilots takes 2 weeks. Pilots first pass a theoretical course which covers the Training Manual and Operations Manual. The subsequent flight training covers normal and abnormal procedures in semi- and full automatic flight modes. Illustrated Parts Breakdown (IPB): compliant to Part-145 and ATA 2200. The HEF 32’s design is under control of an extensive Part Data Management System to support the IPB. The HEF 32 is subject to 50 hour and annual inspection intervals. Transmission, flight control and rotor structures are subject to overhaul intervals of 400 flight hours. Due to the affordability of the engine, it is not overhauled, but replaced at fixed intervals. A similar approach is used on several structures, to provides a truly cost-effective, continuous and safe maintenance solution for international operators.